Spring football is a wonderful time of year as a fan. The hype machine is in full swing heaping out-sized expectations on early enrollees (e.g., Canton Kaumatule ) and highly recruited second-year players who are looking to take a jump to the next level (e.g., Arion Springs). Additionally, as fans, you get an opportunity to read way too much into every little bit of information that leaks out of spring practice. With the first game still far too many months away, there isn’t much else that can be done. In the spirit of drawing conclusions from the small amount of information that comes from a few practices, I’ve done my best to assess the current quarterback competition and project what it means going forward. At this point, it looks like the Oregon quarterback race is likely to come down to Lockie and Adams in the fall. The other four quarterbacks competing this spring don’t appear to be making up the necessary ground on Lockie to emerge as the starter this fall. The bits of information on how the quarterbacks are performing is essentially confined to what coaches say in post-practice interviews and the practice reports from Rob Mosely of GoDucks.com. The coaches’ answers to post-practice interview questions on player performance seem to be more about publicly praising players for the improvement they’ve made. Rob Mosely is the lone person reporting on what happens inside practice. Rob is a great journalist who worked for the Register-Guard before being employed as Editor-in-Chief of athletic communications for the University of Oregon. As such, he is somewhat limited on what he can report. With two weeks left in spring practice, Jeff Lockie remains the front-runner to start for Oregon this fall. However, by reading between the lines of various quotes from coaches and the practice reports from Rob, you can begin to see a picture of how the quarterback situation is emerging this spring. Jeff Lockie is the clear front-runner right now. Mark Helfrich told Pete Martini of the Statesman Journal that Lockie has been “outstanding” and that he has been great, “both physically, and (with his) intangibles of getting guys lined up, vocal leadership, (and) taking control.” Based on that endorsement and his position as the front-runner at the beginning of spring, it is hard to think his status has diminished. Additionally, based on who Mosely reports is on the field with Lockie during team periods, and regularly getting the “first snaps of the period”, it is apparent that he is getting the first team reps. Lockie came into the spring with the most experience of any of the quarterbacks, having spent three years in the program, including two years as the second-string quarterback. Based on this experience, and the hard work he has put into the Oregon program, the Oregon coaches have given Lockie the inside track to win the quarterback battle this spring and into the fall. The quarterback job is Lockie’s to lose and it’s hard to argue that it should not be, given his experience. Despite Lockie having the pole position, Oregon’s culture has proven to be a meritocracy. Coach Helfrich will give his proven players and veterans the first chance to start at any given position, but has no problem with having a younger player supplant his seemingly entrenched veterans. The running back position in 2014 was a perfect example of this. Byron Marshall had just come off a 1,000+ yard year and was the leading returning rusher in the Pac-12. However, he ended up moving to receiver in fall camp after being passed by true sophomore Thomas Tyner. Tyner was then surpassed by true freshman Royce Freeman on the depth chart. With only two weeks left in spring practice, however, it doesn’t appear that the four younger quarterbacks participating this spring are very close to passing Lockie. 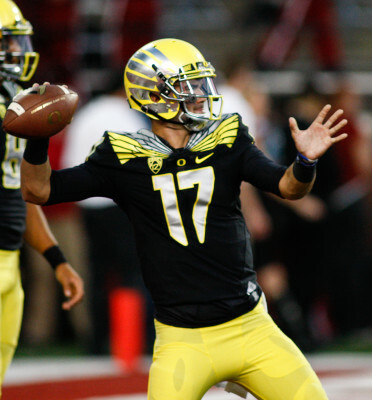 Morgan Mahalak has some ground to make up to become Oregon’s next starter. Of the four younger quarterbacks, Morgan Mahalak seemed the most likely to challenge Lockie as the front-runner heading into the fall. Mahalak was a highly-touted recruit with a four-star pedigree. He has prototypical size, and now has a year under his belt in the program. However, Mahalak has been flying under the radar for the most part this spring. Mosely’s practice reports seem to mention highlights of him less often than any of the other quarterbacks. Additionally, during an interview, coach Helfrich conspicuously left Mahalak out when talking about how his quarterbacks are performing. In a subsequent interview, Helfrich said that Mahalak, “Probably didn’t put his best foot forward (last) fall.” Mahalak is obviously not out of the competition that will continue into the fall. He just appears to be a little behind at this point. Travis Jonsen (formerly Waller) has been a pleasant surprise given that he would still be in high school right now had he not graduated early to compete in spring practice. Helfrich has been impressed with Jonsen’s preparation and play thus far. Helfrich said, regarding Jonsen’s preparation, that, “You can tell Travis did a great job, he knows a lot right now.” Mosely also reported that Jonsen has been making some great plays in practice as well. While Jonsen is still a relative long-shot to start next fall, given he is a true freshman, his film shows him as being very talented, though still quite raw. Should he continue his current rate of progress, he could be a factor this fall. Taylor Alie has also received decent reviews in spring practice from coaches and has been making some plays in practice according to Mosely’s practice reports. Alie is the only other quarterback outside of Lockie with game experience. He is also in his third year at Oregon. However, there is nothing that suggests he is closing in on Lockie. Should Alie win the starting job as a local kid who walked on, it would be a great story, but it doesn’t seem likely at this point. Ty Griffin has also flashed some brilliance in practice at the QB position, according to Mosely. His speed and athleticism are impressive. While Griffin continues to take reps at quarterback, the coaches appear to be trying him out at other positions to find a way to get his athleticism on the field. Mosely has reported Griffin taking reps on both the punt return and punting teams and participating in tackling drills. Quarterbacks with a decent chance to be the starter are not asked by coaches to risk injury by playing on special teams and participating in contact drills. 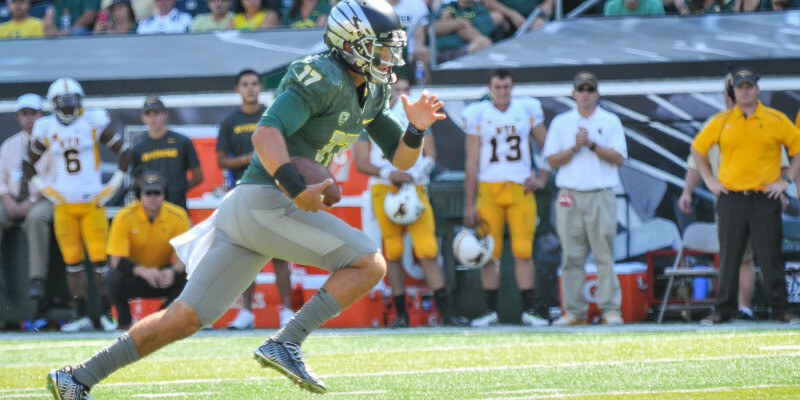 Even Mariota, with all his athleticism, did not appear on special teams for Oregon. I am excited to see Griffin on the field this fall. It does not look like that will happen at the quarterback position, however. Vernon Adams is currently still a student at Eastern Washington and unable to participate in spring practices. It appears he is doing everything he can to position himself to challenge Lockie, and the others, for the starting job in the fall. Adams spent a week on campus watching practice and even studied the play call signals. He’s also been getting to know the Oregon receivers and thrown passes to them outside of spring practice sessions. Unless something changes dramatically over the last two weeks of spring practice, Lockie will likely be the front-runner heading into fall camp. Vernon Adams appears to be preparing himself to provide Lockie with a stiff challenge this fall. It should be exciting to watch!